About NQ CARAVAN RENTALS "MCKENZIE"
McKenzie has a permanent double bed down one end, kids bunk bed at the other end, full kitchen, toilet and shower on board. Comes complete with all the gear. Create lifelong family memories this holidays! Mckenzie is set up to make it easy for both first time and experienced campers. Being a family van, we have Mckenzie complete with everything included to make your stay comfy and carefree. The front bed is a double and there are two children-sized bunk beds at the rear. All you need to bring along is your clothes and food! Bed linen can by provided at small cost. All kitchen utensils and cooking appliances supplied. Jura fully automatic coffee machine included with a 250g bag of coffee beans to start your day off right. Webber BBQ (outdoor use). 23 inch TV and DVD player with wind-up TV antenna. Complimentary tea & coffee. Tables and chairs. If you plan to stay at a caravan park, all the leads, hoses, etc are provided, The extra-large fridge can be run off 240V, GAS & 12V. Twin AUX battery kit - can power lights and 12V accessories for up to 6 days. The van is fully air conditioned and has been upgraded to a super quirt to run model. The van is fitted with a water tank, hot water system and gas bottles. The gas can be used to power the 3-way fridge, a BBQ and stove. Perfect for camping where there is no power. ALL deposits must be paid within 48 hours of booking. The service fee includes electric brake controller, towing mirrors, Gas in the Gas bottle for you to use. All the supply's in the kitchen and a standard clean. THE VAN MUST COME BACK AS CLEAN AS IT LEFT. WHAT DOES THE BOOKING FEE COVER?. It covers comprehensive insurance, Premium road side assistance. $3000 emergency accommodation package is something happens to the van. A 24hr help line and a secured payment & bond system . All our Rv's are comprehensively Insured . Please note our policy does not cover under body damage caused from off road use. 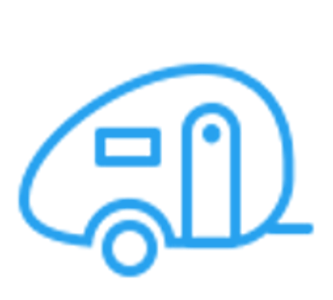 The minimum age to tow or drive any of our Rv's is 21. .This Van is for Sealed Roads only. If you wish to go off road please look at our "Austin" Van Jayco Swan Outback. Great first time caravan experience, very easy with no fuss in a brand new van. The kids loved the bunks, wife loved the aircon, toilet and shower. Easy to tow and set up. We'll be back. Hayden was easy to deal with, he went out of his way to ensure we were comfortable with the workings of the van. Mckenzie is a brand new van and we were the first to Lease, the van was great to tow, Hayden provided everything you'd require to make your trip enjoyable, I'd highly recommend Hayden and would lease again with him.